Joseph and the Amazing Technicolor Dreamcoat is a musical or operetta with lyrics by Tim Rice and music by Andrew Lloyd Webber. The story is based on the "coat of many colors" story of Joseph from the Bible's Book of Genesis. This was the first Lloyd Webber and Rice musical to be performed publicly (the first, The Likes of Us, written in 1965, was not performed until 2005). The show has little spoken dialogue; it is completely sung-through. 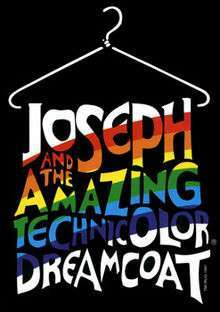 Its family-friendly storyline, universal themes and catchy music have resulted in numerous productions of Joseph and the Amazing Technicolor Dreamcoat; according to the Really Useful Group, by 2008 more than 20,000 schools and amateur theatre groups had successfully put on productions. Joseph was first presented as a 15-minute pop cantata at Colet Court School in London in 1968 and was recorded as a concept album in 1969. After the success of the next Lloyd Webber and Rice piece, Jesus Christ Superstar, Joseph received stage productions beginning in 1970 and expanded recordings in 1971 and 1972. While still undergoing various transformations and expansions, the musical was produced in the West End in 1973, and in its full format was recorded in 1974 and opened on Broadway in 1982. Several major revivals and a 1999 straight-to-video film, starring Donny Osmond, followed. Lloyd Webber's composer father, William, felt the show had the seeds of greatness. He encouraged and arranged for a second performance — at his church, Westminster Central Hall — with a revised and expanded format. The boys of Colet Court sang at this performance in May 1968, which also included the Mixed Bag. It received positive reviews: London's Sunday Times said it was a new pop oratorio. By its third performance at St Paul's Cathedral in November 1968, it had been expanded to 35 minutes and included songs such as "Potiphar". Novello agreed to publish the work, and Decca Records recorded it in 1969 as a concept album. David Daltrey, front man of British psychedelic band Tales of Justine, played the role of Joseph; and Tim Rice was Pharaoh. Other vocalists included Terry Saunders and Malcolm Parry of the Mixed Bag. In 1969, Lloyd Webber and Rice used the popularity of their second rock opera, Jesus Christ Superstar, to promote Joseph, which was advertised in America as a "follow-up" to Superstar. Riding on Superstar's coattails proved profitable for Joseph, as the US Decca recording of Superstar had been in the top of America's charts for three months. The first American production of Joseph was in May 1970, at Cathedral College of the Immaculate Conception in Douglaston, New York. Following this, according to Lloyd Webber's Really Useful site, "there followed huge interest from colleges and schools." Decca Records recorded Joseph in 1969 as a concept album, credited to the Joseph Consortium. David Daltrey, front man of British EMI psychedelic band Tales of Justine, played the role of Joseph and lead guitar; and Tim Rice was Pharaoh. Other vocalists included members of the Mixed Bag group such as Terry Saunders and Malcolm Parry, and the choir of Colet Court School. Daltrey, although not part of the Mixed Bag group, was managed by Tim Rice and Andrew Lloyd Webber at the time, and fellow EMI colleague Martin Wilcox had suggested the Mixed Bag to Tim Rice to help out as a backing group on the album. A recording of the musical with 19 tracks was issued in the US on Scepter Records in 1971. It was a reissue of the 1969 Decca UK album, capitalising on the success of 1970's Jesus Christ Superstar in the US It featured David Daltrey as Joseph, Tim Rice as Pharaoh, Dr. William S. Lloyd Webber on the Hammond organ, Alan Doggett conducting, various solo vocalists and instrumentalists, and the Colet Court choir as the chorus. In late August and September 1972, Joseph was presented at the Edinburgh International Festival by the Young Vic Theatre Company, directed by Frank Dunlop. It starred Gary Bond in the title role, Peter Reeves as the narrator, and Gordon Waller as Pharaoh. In October the production played at London's Young Vic Theatre, and in November at the Roundhouse. The production was part of a double bill called Bible One: Two Looks at the Book of Genesis. Part I, entitled The Genesis Mediaeval Mystery Plays: The Creation to Jacob (at the Young Vic originally called simply Mediaeval Mystery Plays), was Dunlop's reworking of the first six of the medieval Wakefield Mystery Plays, with music by Alan Doggett. Part II was Joseph and the Amazing Technicolor Dreamcoat. The Young Vic production was recorded for an LP released on the RSO label in 1972. This production was also televised in the UK by Granada Television in 1972. In February 1973, theatre producer Michael White and impresario Robert Stigwood mounted the Young Vic production at the Albery Theatre in the West End, where it ran for 243 performances. The mystery plays which had preceded the original Young Vic productions were dropped, and instead the musical was preceded by a piece called Jacob's Journey, with music and lyrics by Lloyd Webber and Rice and a book by television comedy writers Ray Galton and Alan Simpson. The new opening piece, Jacob's Journey, which contained a great deal of spoken dialogue, was eventually phased out in favour of a completely sung-through score. The first production of the show in its modern, final form was at the Haymarket Theatre in Leicester, which presented the musical several times in the mid- to late-1970s. A recording of the full musical was released on the MCA label in 1974, again featuring Gary Bond, Peter Reeves, and Gordon Waller. This is the earliest recording of Joseph to eventually go to CD. Gordon Waller also appeared on another recording in 1979, featuring Tim Rice as the Narrator and Paul Jones as Joseph, on the Music For Pleasure label. In 1975 Miranda Enterprises in association with Leicester Theatre Company presented a production of Joseph at the Queen's Theatre, Hornchurch. It was directed by Paul Tomlinson, choreographed by David Thornton, and designed by Hugh Durrant, with Chris Littlewood as the musical director. This production starred Patrick Ryecart as Joseph, David Sadgrove as Pharaoh, and had three Narrators: Nigel Baldwin, Ben Bazell, and Patrick Reilley. Ken Hill directed a large-scale production of Joseph at the Westminster Theatre, London, which ran from November 1978 to February 1979, and again from November 1979 to February 1980. This production starred Paul Jones as Joseph, John Golder as the Narrator, and Leonard Whiting as Pharaoh. The producer was Martin Gates, the musical director was Jack Forsyth, the lighting designer was Francis Reed, and the designer was Saul Radomsky. A recording of this production with additional narration spoken by children was broadcast on BBC radio, produced by Richard Wilcox. The musical ran at the Brooklyn Academy of Music in New York in 1976 and in 1977 as "holiday fare". In the 1976 production, which opened on 30 December, direction was by John Dunlop, with a cast that featured Cleavon Little as the Narrator and David-James Carroll as Joseph. In the 1977 production, running in December through 1 January 1978, staging was by Graciela Daniele, and David-James Carroll played Joseph, Alan Weeks played the Narrator and William Parry played Pharaoh/Elvis. Joseph opened in an Off-Broadway production at the Entermedia Theatre on 18 November 1981, and ran through 24 January 1982. Directed by Tony Tanner, the cast starred Bill Hutton as Joseph, Laurie Beechman as the Narrator, and Tom Carder as Pharaoh. The New York Times review noted that the musical had previously played at the Brooklyn Academy of Music, and that this 1981 Entermedia Theatre production was the "professional Manhattan premiere". The musical transferred to Broadway at the Royale Theatre on 27 January 1982 and ran through 4 September 1983, with 747 performances. Directed and choreographed by Tony Tanner, the off-Broadway cast reprised their roles, with Bill Hutton as Joseph, Laurie Beechman as the Narrator, and Tom Carder as Pharaoh. This production was recorded for release on the Chrysalis label, and is the first to feature the Prologue (dubbed on the Chrysalis release "You are what you feel"). The show received several Tony Award nominations including Best Musical and Best Original Score. Allen Fawcett replaced Hutton as Joseph in late June 1982. David Cassidy took over the role of Joseph in March 1983 through 10 September 1983 and performed in the touring cast in 1983/1984. A new North American touring production began on 4 March 2014 in Cleveland, Ohio starring Diana DeGarmo as the Narrator and Ace Young as Joseph. 2014 marks the 20th Anniversary performance of Joseph at the State Theatre in New Jersey. The Production has been Produced through the regional theatre group Plays in the Park, located in Edison, New Jersey. The production has been running every year, since 1995, with this years performance dates 26, 27 and 28 December. With Jason Donovan in the lead, the expanded show was restaged in 1991 at the London Palladium with Steven Pimlott as director, winning the 1992 Laurence Olivier Award for set design. The cast album of this production was the #1 UK album for two weeks in September 1991, and the single "Any Dream Will Do" from it was also the #1 UK single for two weeks in June–July 1991. When Donovan left, former children's TV presenter Phillip Schofield portrayed Joseph. The musical opened in Toronto at the Elgin Theatre in July 1992, with Donny Osmond as Joseph and Janet Metz as the Narrator. The show was revived in the United States in 1993, playing in Los Angeles at the Pantages Theatre for 18 weeks and in San Francisco at the Golden Gate Theatre for an 8-week run before moving to Broadway, playing at the Minskoff Theatre from 10 November 1993 to 29 May 1994 for 231 performances. Directed by Steven Pimlott and choreographed by Anthony Van Laast, the cast featured Michael Damian (Joseph), Kelli Rabke (Narrator), Clifford David (Jacob), and Robert Torti (Pharaoh). In 1999, a straight-to-video film starring Donny Osmond was released, directed by David Mallet. Osmond had toured North America in the role after opening the Toronto revival in 1992. In the film, Maria Friedman appears as the Narrator, Richard Attenborough as Jacob, Ian McNeice as Potiphar, Joan Collins as Mrs. Potiphar and Robert Torti as Pharaoh. A modest production starring former Boyzone singer Stephen Gately, "with cartoon cut-out sets and props and naff panto choreography", previewed in Oxford in December 2002, before moving to Liverpool over Christmas 2002. This production reached the West End at the New London Theatre in March 2003. A US national tour began in September 2005 in Milwaukee, Wisconsin and starred Patrick Cassidy. A 2007 revival of the London Palladium production at the Adelphi Theatre was the subject of BBC One's second search for a West End star, capitalising on the success of the BBC's 2006 Lloyd Webber talent search series, How Do You Solve a Problem Like Maria?. This new talent search show, Any Dream Will Do, with the participation of Lloyd Webber and other theatre luminaries, sought a new leading man to play Joseph. More than 3 million viewers cast votes during 9 June 2007 series finale, and made 25-year-old Lee Mead "officially the people's Joseph". Mead had given up his ensemble role in The Phantom of the Opera, where he also understudied Raoul. The new Joseph production, which began on 6 July 2007, used Steven Pimlott's (who had died since staging the Palladium production) original direction, with Bombay Dreams star Preeya Kalidas as the Narrator. Tickets for the show's originally-planned six-month run sold so fast that in three weeks all tickets for the first three months were sold out, and the producers had extended the show's run — and Mead's contract — until 7 June 2008. Before opening night, the producers had banked £10 million in receipts from advance ticket sales. In his review for Variety, David Benedict wrote, "Mead delivers.... [He] is contracted for at least a year. For as long as Mead chooses to continue in it, Joseph is, commercially speaking, the safest of bets." Lloyd Webber's Really Useful Group donated all receipts from two special performances to the BBC's Children in Need charity appeal. Additionally, the money normally given to the cast for first-night gifts in July 2007 went instead to Children in Need. In January 2009 Mead left the show and was replaced by Gareth Gates. The production closed in May 2009. The long-running UK touring production was re-cast in 2010 with Keith Jack taking on Joseph in July 2010 opposite Jennifer Potts as narrator. Jack left at the end of his contract in May 2013 with former Steps (group) member Ian "H" Watkins reprising the role he had played in London and on tour taking over. Potts rejoined the cast at the same time. The 2014-15 leg of the tour saw X Factor Series 6 star Lloyd Daniels take on the title role with Eastender's star Matt Lapinskas playing Pharaoh. Danielle Hope played Narrator for the whole of the 2014 dates. Marcus Collins, also of X Factor fame, was announced as Hope's replacement but left his contract before his rehearsals began. Understudy Rebekah Lowings rejoined the cast in the interim before Amelia Lily, another X factor alumna, took over in February. The 2016 UK touring production starred Joe McElderry as Joseph and Lucy Kay as the Narrator. The tour began in January 2016 and is scheduled to run through July 2016. Back home, his brothers, led by Reuben (Levi in the original Broadway production) and accompanied by their wives, break the news to Jacob that Joseph has been killed. They show his tattered coat smeared with his blood – really goat blood – as proof that what they say is true ("One More Angel in Heaven"). After the bereft Jacob leaves, the brothers and their wives happily celebrate the loss of Joseph. The Narrator tells of impending changes in Joseph's fortunes ("A Pharaoh Story") because the Pharaoh is having dreams that no one can interpret. Now freed, the Butler tells Pharaoh (acted in the style of Elvis Presley) of Joseph and his dream-interpretation skills ("Poor, Poor Pharaoh"). Pharaoh orders Joseph to be brought in and the king tells him his dream involving seven fat cows, seven skinny cows, seven healthy ears of corn, and seven dead ears of corn ("Song of the King"). Joseph interprets the dream as seven plentiful years of crops followed by seven years of famine ("Pharaoh's Dreams Explained"). An astonished Pharaoh puts Joseph in charge of carrying out the preparations needed to endure the impending famine, and Joseph becomes the most powerful man in Egypt, second only to Pharaoh himself ("Stone the Crows"). (In the 2007 London revival, Pharaoh has a new song, "King of my Heart"). Back home, the famine has caught up with Joseph's brothers, who, led by Simeon, express regret at selling him and deceiving their father ("Those Canaan Days"). They hear that Egypt still has food and decide to go there to beg for mercy and to be fed ("The Brothers Come to Egypt"), not realising that they will be dealing with Joseph ("Grovel, Grovel"). Joseph gives them sacks of food, but plants a golden cup in the sack of his youngest brother, Benjamin. When the brothers try to leave, Joseph stops them, asking about the "stolen cup". Each brother empties his sack, and it is revealed that Benjamin has the cup. Joseph then accuses Benjamin of robbery ("Who's the Thief?"). The other brothers, led by Judah, (Naphtali in the original Broadway Production) beg for mercy for Benjamin, imploring that Joseph take them prisoner and set Benjamin free ("Benjamin Calypso"). In some productions, the finale is followed by a rock/disco medley of most of the musical's major numbers ("Joseph Megamix"). Narrator: A woman (in original productions, a man), not of the time or place of the action. The Narrator tells the story through word and song, guiding the audience gently through the story of Joseph and his brothers, usually gives meaning to the story with her/his words. Jacob: The father of twelve sons, his favourite being Joseph. At times he may appear unfair and shallow, but he is, more importantly, the prophet who recognises the future and the calling of Joseph, thus saving the House of Israel. Usually doubles as Potiphar. Joseph: Eleventh son of Jacob. Obviously his father’s favourite, Joseph early on shows a talent for interpreting dreams and telling the future. This gets him into trouble with his brothers when he predicts his future will include ruling over the other eleven. However, it saves his life when in Egypt he correctly interprets Pharaoh’s dreams. In the end he has risen to a great position of power, but he still forgives his brothers and brings his family to Egypt to partake of the bounty he has accumulated there. Ishmaelites: Men of the desert, they buy Joseph as a slave, take him to Egypt, and sell him to Potiphar. Potiphar: A powerful and rich Egyptian, Potiphar purchases Joseph and puts him to work in his household, where he soon realises that Joseph is honest, hard-working, and a great addition to his pool of help. When he grows suspicious of Mrs. Potiphar and Joseph, however, he grows angry and has Joseph thrown into prison. Usually played by the actor playing Jacob. Mrs. Potiphar: Beautiful and scheming, Mrs. Potiphar tries to seduce Joseph, but is unsuccessful. However, she does manage to rip off much of his clothing just as her husband comes into the room, thus condemning him to prison. Also plays one of the wives. Baker: One of Pharaoh servants, the Baker is in prison with Joseph who correctly interprets his dreams and predicts that he will be put to death. Played by one of the brothers. Butler: Another of Pharaoh servants, the Butler is also in prison with Joseph who also correctly interprets his dreams, this time that he will be released and taken back into Pharaoh's household. It is the Butler who tells Pharaoh about Joseph and his uncanny ability with dreams. Played by one of the brothers. Pharaoh: The most powerful man in Egypt, Pharaoh is considered a god on earth. When Joseph interprets his dreams, he promotes him to one of the highest positions in his government. In most productions, Pharaoh is portrayed as an Elvis Presley-style figure. Sometimes played by one of the brothers. Joseph's Eleven Brothers: Although acting usually as a group, they each have their own different personalities, talents, and flaws. As a group they sell Joseph into slavery, but as individuals they deal with the following years and how they can make amends. They sing and dance their way through many situations and places. The brothers also double as Egyptians and servants of Potiphar. Reuben: Eldest son of Jacob. Takes the lead on "One More Angel in Heaven"
Simeon: Second son of Jacob. Takes the lead on "Those Canaan Days"
Levi: Third son of Jacob. Judah: Fourth son of Jacob. Takes the lead on "Benjamin Calypso". Dan: Fifth son of Jacob. Naphtali: Sixth son of Jacob. Gad: Seventh son of Jacob. Asher: Eighth son of Jacob. Issachar: Ninth son of Jacob. Zebulun: Tenth son of Jacob. Benjamin: Twelfth son of Jacob. Joseph accuses him of stealing the golden cup. The Wives: The wives of Jacob. The actresses playing the wives also double as Egyptians and servants of Potiphar. Notable in the composition of the music is the variety of styles used by Lloyd Webber, including parodies of French ballads ("Those Canaan Days"), Elvis-inspired rock and roll ("Song of the King"), western ("One More Angel In Heaven"), 1920s Charleston ("Potiphar"), Calypso ("Benjamin Calypso"), jazz ("Joseph's Dreams"), and 1950s music ("Go, Go, Go Joseph"). Often, productions will make costume and prop changes to reflect each of the various musical styles. "Prologue" is a late addition to the show, not included in any recordings produced before the 1982 Broadway production; the use of "Any Dream Will Do" at the start of the show (and the renaming of the closing version as per the above list) dates from the 1991 revival. "Poor, Poor Pharaoh" is the Pharaoh reprise of "Poor, Poor Joseph". The UK touring production circa 1983-1987 (produced by Bill Kenwright), included an additional song "I Don't Think I'm Wanted Back At Home", which was originally part of Jacob's Journey. Sung by the title character, the brothers jokingly throw Joseph out of the family home, throwing a number of props at the lone Joseph who is seen in a spotlight – first a suitcase, then a cane and top hat, leaving our hero to tap-dance his way to the end of the number. The tune has been recycled into numbers in By Jeeves and The Likes of Us. In 2013, Lloyd Webber stated that Joseph was being adapted for a theatrical-release film. In the interview, he noted that a film version of Joseph had been discussed for years, and due to the success of the 2012 film adaptation of the 1980 musical Les Misérables, interest in adapting Joseph for a feature film had come to fruition. In February 2014, Rocket Pictures, a company directed by Elton John, was chosen to take the rights of the film and make it. A piano/vocal/guitar edition of most of the show's major vocal selections has been published. A vocal score of the original production is also available. And when the 2007 London revival opened, Lloyd Webber and Rice produced a new updated vocal score which contains all of the additional material, including the prologue, new dance music, and updated arrangements. ↑ "Joseph benefits BBC Children in Need". The Really Useful Group. 29 June 2007. 1 2 The Really Useful Group. "About The Show". Retrieved 29 December 2008. 1 2 3 Vocal Selections: Joseph and the Amazing Technicolor Dreamcoat. Milwaukee, WI: Hal Leonard. 1994. ISBN 0-7935-3427-5. 1 2 Slate, Libby (30 May 1993). "On View : The Many Stages of Michael Damian". The Los Angeles Times. Retrieved 14 April 2014. ↑ Bloom, Ken (2003). Broadway: An Encyclopedia. Routledge. p. 552. ISBN 9781135950194. ↑ Brantley, Ben (11 November 1993). "Review/Theater: Joseph and the Amazing Technicolor Dreamcoat; Joseph And His Brothers, To Music". The New York Times. Retrieved 14 April 2014. ↑ "IMDB listing for 1999 video". Retrieved 17 August 2007. ↑ John Wood, North West End Joseph And The Amazing Technicolor Dreamcoat - Palace Theatre, Manchester Retrieved 30 March 2016. ↑ Simon Duke, Joe McElderry to take lead role in Joseph & the Amazing Technicolor Dreamcoat Chronicle Live (2 September 2015).Retrieved 20 March 2016. ↑ Simon Mayo,Joseph and The Amazing Technicolour Dreamcoat 2016 UK Tour, britishtheatre.com (23 September 2015). Retrieved 20 March 2016. ↑ Musical Numbers, JosephTheMusical.com. Retrieved 5 January 2014. ↑ "TimRice.com". Retrieved 5 July 2007. 1 2 Cerasaro, Pat (10 December 2013). "Andrew Lloyd Webber Confirms New JOSEPH & THE AMAZING TECHNICOLOR DREAMCOAT Movie". BroadwayWorld.com. Retrieved 2 July 2014. ↑ Siegel, Tatiana (5 February 2014). "Elton John to Adapt 'Amazing Technicolor Dreamcoat' for Big Screen". The Hollywood Reporter. Retrieved 4 April 2016.